Patricia and I have finally finished the first phase of settling into our small apartment (in the Sinaran TTDI complex) in Kuala Lumpur. We're here to apply for the "Malaysia My Second Home" visa that will let us visit and winter in Malaysia for up to ten years. And we're also here to start our new lives as snowbirds, escaping the Michigan winter and renewing our acquaintance with old friends (and new) in Kuala Lumpur and elsewhere in Malaysia. 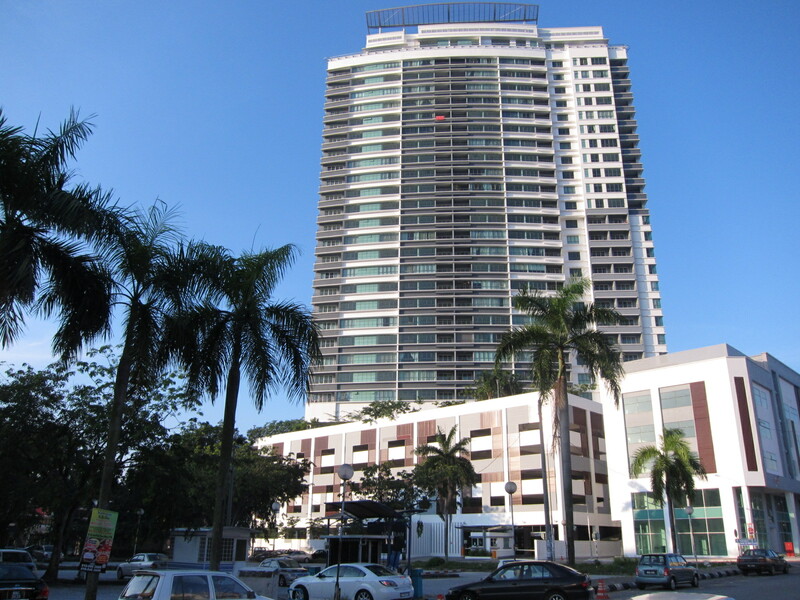 This is a shot of our new home, the Sinaran TTDI condo complex. (You should be able to click on it to view a larger version of the photo.) We have a one-year lease, staying in a small unit while we wait for the completion of a nearby condo complex. It's so new that it's only 30% filled, with more people moving in every day. The flat belongs to Faridah Begum, a good friend of Mary Cardosa, an old friend of ours. Faridah bought it as a "downsizing unit" for her elderly mother, who, in the event, decided not to move. (Sounds like my mother!) 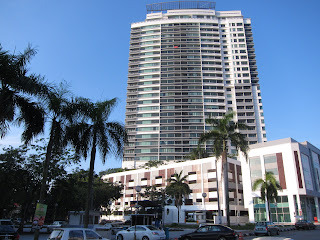 Faridah had just decided to put it up for rent, when we showed up in Kuala Lumpur! So where is Kuala Lumpur? Where's Malaysia, for that matter? As you walk up to the Sinaran condominium in one of the two downtown areas of TTDI, you have to go into the building via this entranceway, using a key card to open the door. One of the friendly security guards, if available, might spot you walking and let you in! We have to use the keycard to take the elevators up to our floor (they won't take us to any other floor). We use normal keys for our apartment entrance. It's a small apartment, about 1,150 square feet in all: a master bedroom with attached bathroom, a small second bedroom, a second bathroom, a kitchenette, a laundry area, living room (left), and balcony. The flat came furnished with most major pieces of furniture. We had to buy smaller items like bedside tables, some kitchen appliances, the TV, and so on and so forth. The stuff we buy will be moved, when the time (ever) comes, to the condo that's under construction. Here you see the dining table and the kitchenette behind it. The open door to the right is the second bathroom. This is the kitchenette. The fridge, the oven, and microwave, with some storage space, face the stove and sink. You can also see our washer-dryer unit in the laundry utility area. Struggling to use this space-challenged kitchenette is a good lesson for us in designing such spaces for our downsizing plans! The second bedroom has become the computer room/office for Pat and me. We just subscribed to a high-speed VDSL broadband service from the phone company. To our surprise, we also get some hi-definition and regular TV channels along with the package, and a land-line phone! Modern technology indeed! One of the great perks living in this complex is the well-equipped gym facilities they have for the condo residents. Pat and I start the day at the gym, she on her treadmill, and me with my physical therapy exercises for my shoulder. Pat and I need this gym ---You'll discover through this blog that this country is a foodie paradise! And the crowning glory for would-be jocks like me is the 25+ meter lap pool just outside the gym! This concludes my tour of the Sinaran complex. Next posting: our neighborhood as seen from our balcony! Hey Howard and Pat, These photos and the commentary are great! Your kitchenette looks the size of a normal kitchen in Tokyo as does your dining/living room. The food stall looks so modern and clean compared to the ones in Vientiane and Phnom Penh...will be out there again this month. Best, Clyde.